During my recent briefing of he ABFA (Asset Based Finance Association) I was asked if we had any insight into switching between invoice finance providers and indeed if users were switching to or from bank owned providers or independents. 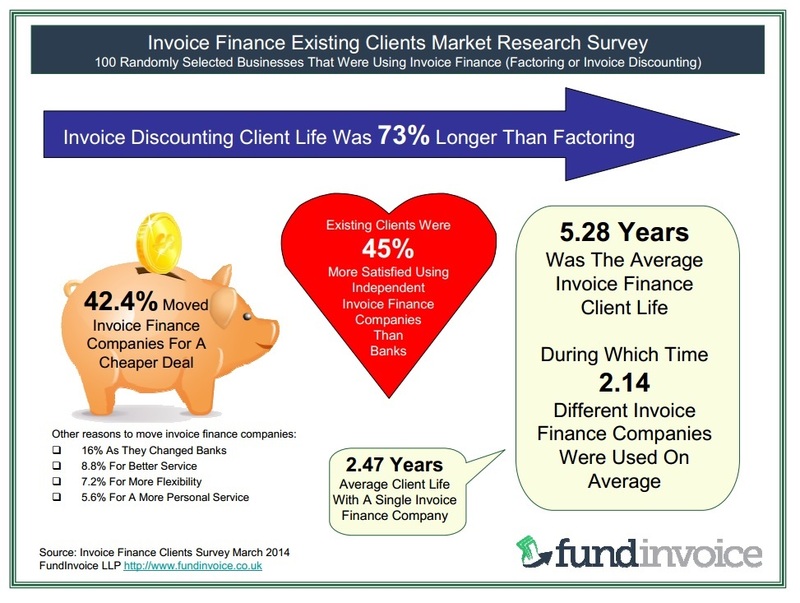 To answer the question, I have looked back at the study of invoice finance users that we completed in March 2014. For the purposes of this article, I have defined "bank owned invoice finance companies" as those owned by the big four high street banks i.e. Barclays Bank, HSBC Invoice Finance, Lloyds Bank Commercial Finance and RBS Invoice Finance. 4% had swtiched three times. So, as previously concluded, the majority of invoice finance users appear to switch providers during their client life (2.14 providers used on average), and the biggest driver of moving provider was to make cost savings (which accounted for 42.4% of the reasons given. 38% had moved to bank owned invoice financiers. 62% had moved to independent invoice financiers. Therefore the majority had moved to an independent. 58% had previously used a bank owned provider. 42% had previously used an independent provider. 37% had previously used a bank owned provider (at some stage). 63% had previously used an independent provider (at some stage). Looking at just those using invoice discounting (54%) there were 57% now using a bank owned provider and 43% using an independent. Of those using factoring (46%) there were 15% using a bank owned provider and 85% using an independent. This indicates a marked preference for a move to the independent sector, among factoring users. The majority of invoice finance users appear to move once during their time using these products. The primary driver of that move is to make cost savings, however there were other reasons given for moving including: changing banks, improving service, seeking more flexibility and a more personal service. When they change providers, the majority (62%) move to an independent provider. There appears to be a particular preference, among factoring users, for independent invoice finance companies.